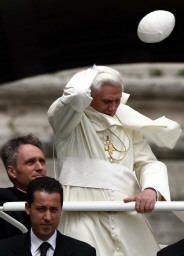 The Road to the Horizon: Headline: The Pope looses hat. Read all about it! Vatican City, February 18 - The pope's hat flew off in an icy blast during Wednesday's general audience but he kept on speaking as if nothing had happened. Benedict XVI had opened the audience by telling the faithful, gathered despite the wintry weather: "It's cold but at least it isn't raining or snowing and we have to be thankful for that".